In what took me as a surprise, I received an alert on my mobile phone from my bankers (DIAMOND BANK) thinking it was a credit alert. I quickly checked and discovered it was a debit alert for stamp duty charge on my savings account. This was totally unacceptable but I was calm and felt there would be a reversal, but it only ended up being worse. They started deducting stamp duty charge on my account twice monthly. 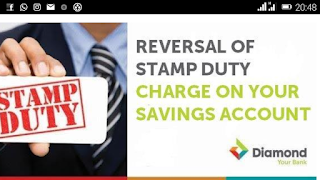 I became fed up and had to storm the bank when I was deducted stamp duty charge for the previous year 2016 while we are in 2017. When I got into the bank my frustrations multiplied as there was a long queue I could not afford to wait for, I quickly thought of an alternative. I had to call DIAMOND BANK customer centre and a young man picked up after several failed attempts. I was very polite and humble because I am the one who is in need of his assistance then. I told him my savings account is being charged stamp duty where as CBN never included savings account in the categories of bank accounts to be charged. He started preaching and talking bureaucracy, and immediately I threatened to close my account. After much deliberation he promised my account will be looked into and I will be given a feedback but days and weeks past by and nothing changed as I was still being debited illegally. Not long ago I was pondering how I could retrieve back my moneys from Diamond bank, so I thought of mailing them. I sat down and drafted a very brief, professional and wonderful email and sent to their contact email. Yes this was the beginning of my triumph over illegal deductions. In a matter of minutes I got a response from diamond bank and behold they were apologizing. I did not celebrate yet because I knew customer care reps are good at that. 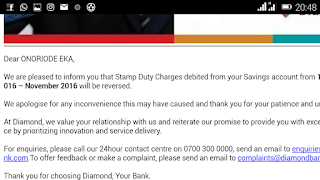 To be very brief I got an email the next morning from my bankers saying the stamps duty charges deducted from my account will be refunded in full. And they did start refunding me bit by bit day after day. I actually thought I was the only victim not until I saw testimonies on facebook from customers of the same bank. ð Go to the bank you operate with and make a formal complaint in writing. ð Ensure you are polite and be well dressed, yes you heard me right dress the way you want to be addressed. ð If after this attempt the issue is still not resolved, call their customer care centre and make a formal report again. At this point you should get something positive response, but if not, then you have to do this. ð Get the bank’s contact email for complaints, now mail them stating your pains and what you have been made to pass through by their poor services. If and when possible threaten to close bank account you have with them. By the time these procedures have been exhausted you should get a positive response because no bank wants to lose a customer mostly in the face of this economic recession we are experiencing in Nigeria.